The good news is that there’s never been more sport on TV. The bad news is that it’s never cost more to view it all. So who’s showing what and how can you access it? And more importantly, how much of a dent will it leave in your pockets? The sports TV market has definitely become far more fragmented recently and there's no longer one single sports channel which will keep everyone happy. Increasingly sports fans will have to double up, or even triple up, on their sports subscriptions if they want access to all the year's main sporting events. So we’ve decided to search through all the different sports packages and TV channels to find out how, and where, you can catch this season's best sporting action. In this post we’ll focus on where to watch rugby, soccer and GAA. Check out our other post on where to catch all the main tennis, golf, and athletics coverage. What are the main sports channels in Ireland? The market is divided into free-to-air channels (RTÉ, TG4 and TV3/Virgin Media One) and paid channels, which are evolving rapidly. The UK free-to-air channels are also usually included with most basic TV packages. 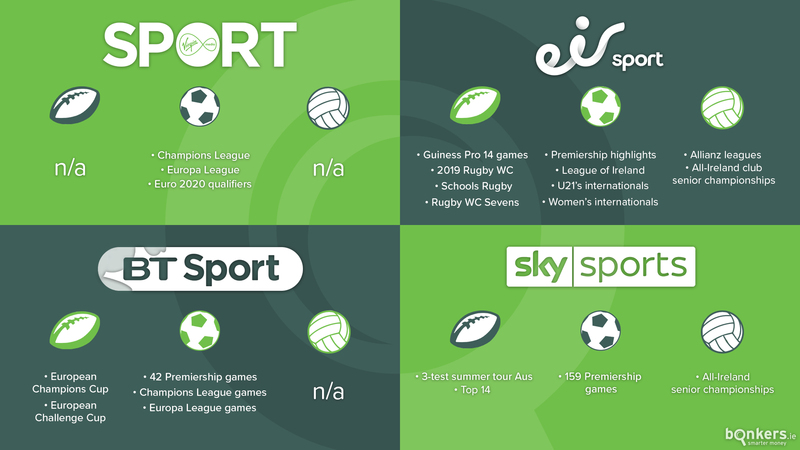 The main established players in the paid sports market are Sky Sports, Eir Sport, BT Sport, and Eurosport. Recent newer entrants include Premier Sports, Eleven Sports, streaming service Amazon Prime, and TV3/Virgin Media, who launched a new sports channel on 18 September called Virgin Media Sport. While major sporting events such as the summer and winter Olympics, soccer World Cup, Six Nations, and GAA All-Ireland finals remain free-to-air, each year more and more sports content is moving onto paid platforms. Where can I watch rugby on TV in Ireland this season? Eir Sport (which includes the BT Sport channels) has rights to all 152 games in the upcoming Guinness Pro 14 season. TG4 also has the rights to broadcast 34 of these matches per season, but it won’t be showing the Munster and Leinster derbies as they’ll be aired exclusively on Eir. Eir Sport also has exclusive rights to the 2019 Rugby World Cup, and will show all 48 games live, including all of Ireland’s matches, and a daily highlights show. However Ireland's pool games as well as the knockout stages and final have been sublicensed to RTÉ so that some of the tournament remains free-to-air. This means RTÉ have the rights to broadcast 14 live matches as well as 16 nights of highlights. Through the BT Sport channels, Eir TV customers can also view the European Champions Cup and Challenge Cup tournaments. RTÉ will continue to show the November test series while TV3/Virgin Media One will show the Six Nations (along with ITV and the BBC) and select Heineken Cup games free-to-air. There’s slim pickings over on Sky, who’ll be showing Ireland’s three-test summer tour of Australia and coverage of the Top 14 season in France - but not much else of interest, at least from an Irish point of view. Where can I watch soccer on TV in Ireland this season? Sky Sports remains the go-to place for coverage of the Premiership action this season, having the lion’s share of games (159), while BT Sport will show 42 games. For the 2019/20 season onto 2022, Sky will only show 128 games and BT Sport will show 52. For the first time Premier Sports will have the rights to show 53 games in Ireland, thus further eroding the dominance of Sky here (these games are largely being shown in the UK on Amazon Prime). Highlights will continue to be shown on the BBC on Match of the Day. All the Champions League and Europa League games will be shown on Virgin Media Sport and Eir Sport/BT Sport. Meanwhile Eleven Sports is the place to go if you want to catch action from the top leagues in Europe: Spain (La Liga), Italy (Serie A) and Germany (Bundesliga). On free-to-air TV, RTE will continue to show a Tuesday night Champions League game and TV3/Virgin Media One will too. TV3/Virgin Media One have also committed to showing the Champions League and Europa League finals, ensuring they remain free-to-air. RTÉ will also show Ireland’s qualifiers for the 2020 and 2022 European and World Cup as well as coverage of the SSE Airtricity League of Ireland (along with Eir). Where can I watch GAA on TV in Ireland this season? Most coverage remains free-to-air although Sky, who controversially signed a deal with the GAA in 2014, thus putting games behind a paywall for the first time, continues to have rights to show a number of exclusive All-Ireland championship games for the coming years. RTÉ will show up to 31 football and hurling championship games exclusively each season, including all the provincial finals and two all-Ireland quarter-finals. The semi-finals and final will be shown on a simulcast basis with Sky (who’ll show up to 14 games exclusively, including two All-Ireland quarter-finals). RTE will also show highlights of the Allianz football and hurling leagues on a Sunday. Eir Sport will show live coverage of the Allianz football and hurling leagues, with up to three games on a Saturday night, and up to 30 All-Ireland club senior football and hurling games. TG4 will show up to three league games on Sunday afternoons (two live and one deferred) as well as a Monday night highlights programme, which will also show highlights of All-Ireland matches. They’ll also broadcast All-Ireland club senior football and hurling matches on Sunday afternoons. For 2019-2022 English Premier League seasons Sky has rights to 128 games and BT Sport has rights to 52. How can I access sports channels in Ireland and what will it cost? The Eir Sport pack comes with seven channels: Eir Sport 1, Eir Sport 2, and exclusive access to BT Sport 1, BT Sport 2, BT Sport 3, BT Sport ESPN, and BoxNation. It’s free to all Eir TV customers. Eir broadband and mobile bill pay customers, and Sky customers who have Eir broadband, can also access the Eir Sport pack for free through the Eir Sport app. Broadband packages start from €39.99 a month while broadband and TV packages start from €54.99 a month, both on a 12-month contract. If you’re a Sky TV or Vodafone TV customer who doesn't have Eir broadband or mobile, you can sign up to Eir Sport for €245 a year or €27.50 a month. Virgin customers don’t currently have any way of accessing Eir Sport. Sky Sports costs €40 a month on top of your basic TV package, though there are regularly half-price offers and discounts for new customers. If you’re a Sky, Eir or Virgin TV customer it can easily be added to your subscription. Sky comes with several dedicated sports channels and has long been viewed as THE sports channel for premier sporting action. However, over the past few seasons, several high profile sporting events such as the US Open tennis and US PGA golf have been lost to rivals. Sky Sports can also be bought as an add-on to streaming service NOW TV (which itself costs €15 a month), with the option of purchasing a daily, weekly or monthy pass, meaning fans can sign up just to view specific tournaments if they want. Free to all Virgin Media TV customers. If you’re a customer of one of Virgin Media’s other services such as mobile or broadband, you’ll also be able to access Virgin Media Sport and all live matches through the Virgin Media TV Anywhere App for free for the first two months, then at a reduced rate of €10 a month thereafter. For all other customers, it’s €20 a month on a 30-day contract. Available with Sky, Eir and Virgin TV packages (though not the basic TV package). Can also be accessed online through the Eurosport Player for €3.99 a month for 12 months or an upfront cost of €39.99 for the year. Also the option of paying €6.99 for just one month. Particularly good for athletics and tennis coverage, which we’ve reviewed in a separate post. Can be accessed through streaming. Users have the opportunity to avail of a free 7-day trial. Irish customers can then pay €6.99 a month or €59.99 for the year. Eleven Sports will live stream at least one match from both La Liga and Serie A on Facebook every week. Premier Sports is currently only available in Great Britain and Northern Ireland on the Sky and Virgin platforms for £9.99 a month. However, as discussed above, Premier Sports has Premiership rights to 53 games in the Republic for the 2019/2022 seasons, so this will likely lead to talks between the broadcaster and Irish platforms like Sky, Eir, Virgin so as to be able to show the games in Ireland. The main rival to Netflix. Users have the opportunity to avail of a free 7-day trial. Irish customers can then pay €2.99 a month for the first six months and €5.99 a month thereafter. Ready to sign up to a sports package? At bonkers.ie we usually encourage people to switch as often as possible as we know that switching saves. When it comes to picking a sports package, you really need to do your research though as there’s no point switching to a cheaper deal if the one you choose isn’t showing any of the sports you actually like. You'll need to carefully decide what sports and events you want to see the most and then factor this, and the price, into the package that you choose. And if you're only interested in watching a few specific tournaments a year, you should consider the option of daily, weekly or monthly one-off subscriptions instead. Then, once you know what you want, you can easily compare all TV packages and providers and switch on bonkers.ie.